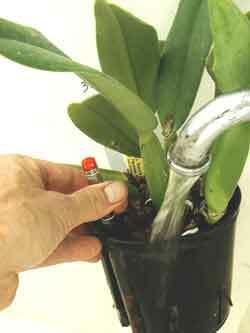 The most important plant care tip for Cattleya after transplanting is DO NOT OVERWATER! In nature, Cattleya grow in the trees and on rocks with their roots exposed to the elements. Their roots are acustomed to good air circulation and they dry out quickly after rain showers. 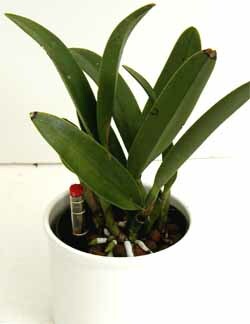 The LECA pebbles in our Hydroponic System are excellent for Cattleya roots. 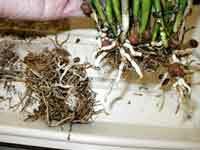 They drain quickly and won't decompose or compact over time, promoting maximum air flow at the roots. 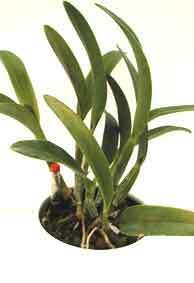 Cattleya transplants might take a little time adjusting to their new home. 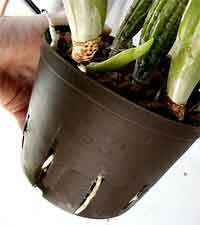 (This is especially true if you're transplanting during the cooler winter months when new growth is slow.) During the first 4-6 weeks water new transplant sparingly. Just pour a KLN solution of 2 TBLS per gallon through the root system. Don't allow standing water at the base. We're not using the water gauge yet - except as a handle to lift the plant. Repeat this process 1-2 times each week until you see signs of new growth. (This might take a couple of months during the winter season.) You're going to need a little patience here. New growth means your plant has adapted to hydroponics. Now you can start using the water gauge to help establish your watering schedule. Remember, cattleya don't like constant moisture so be sure to allow plenty of time for the system to dry out completely between waterings. It's better te error on the dry side here. Water to 1/4 - 1/2 on gauge. Never go above the "Opt" line. Wait until gauge reads "Min". 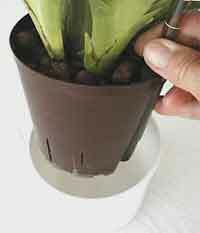 Then lift plant and check bottom of the outer po for moisture. Rewater only after system is completely dry. This might take 2-3 weeks! New roots pushing out the bottom of the culture pot is another good sign (this will take several months). Also, notice root growing vertically in the upper left corner near my thumb. This is normal. Healthy roots don't always grow down inside the pebbles. 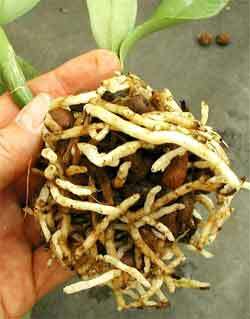 Most Cattleya form entirely new root systems after transplanting. This photo was taken about a month after transplanting (during active growth season). Notice the vigorous new hydroponic roots forming around the LECA pebbles. These plants take their time adapting to the system. We've seen Cattlyeas that look really bad make full recoveries in our system. Don't give up! 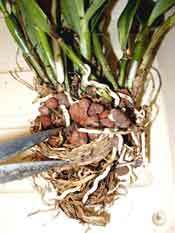 If your plant has wilted leaves several weeks after transplanting, it's not absorbing moisture at the roots. Wilting leaves! Your first instinct is more water. Inactive roots need more air, not more water. Time to take a look and see what's going on inside the grow pot. Don't worry if the leaves look wilted. 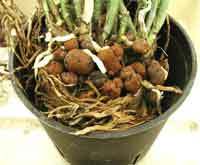 Gently remove plant from culture pot and inspect the root system. This plant has been over watered. As you can see, new roots are forming but the old roots are decaying. Cut away the old decaying roots and wash system again. Old roots on left have been removed. New plant on right will be planted again. New plant - ready to try again. Watering routine is back to pouring a KLN solution of 2 TBLS per gallon through the root system. Don't allow standing water at the base until you see new growth.